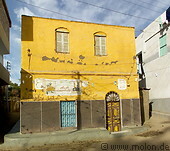 A selection of pictures of the Elephantine island, which lies in the Nile near Assuan. The name derives from the shape of the smooth grey boulders which surround the island. The island has been inhabited since the early dynastic period. Nowadays there is a Nubian village and the fields are cultivated.